Becoming partly cloudy after some evening rain. Low 46F. Winds NNW at 15 to 25 mph. Chance of rain 70%. 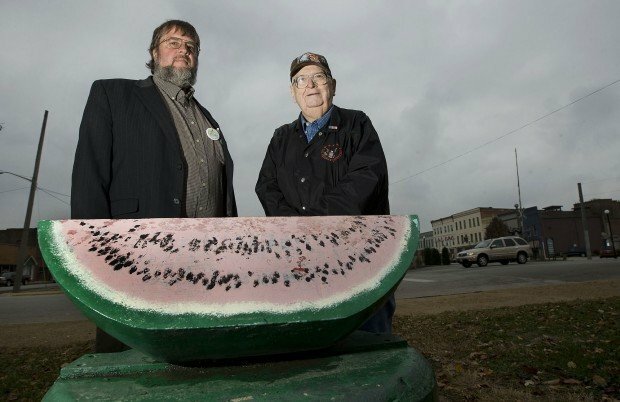 (Herald & Review/Jim Bowling) Abraham Lincoln Tourism Bureau of Logan County executive director Geoff Ladd, left, and historian Paul Gleason have extensive knowledge of Abraham Lincoln’s christening of the town of Lincoln with melon juice commemorated with a watermelon statue at 101 North Chicago Street near downtown Lincoln. 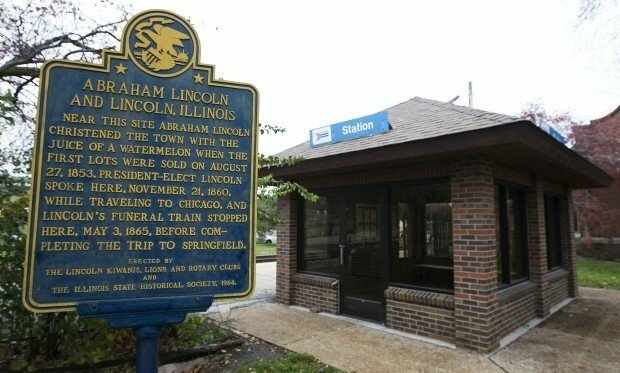 (Herald & Review/Jim Bowling) The Illinois State Historical Marker pictured here that was originally posted next to the watermelon statue was reposted a few feet away next to the Lincoln Amtrak station to make way for a new sign in 2004. LINCOLN — The fruits of Abraham Lincoln’s life just keep on giving. And while his memory may be enshrined in the hearts of the people forever, that doesn’t stop Hollywood from regularly resurrecting it. Right now, we have Steven Spielberg’s big screen epic “Lincoln,” and recently audiences were treated to “Abraham Lincoln: Vampire Hunter,” a darker side of his resumé that seems to have previously escaped official biography. But there is one place and incident that goes beyond anything Tinseltown ever dreamed of and which brought a knife-wielding 16th president into intimate contact with fresh fruit. Amazingly, that place is right here in Central Illinois, and it’s also called Lincoln. Geoff Ladd, executive director of the Abraham Lincoln Tourism Bureau of Logan County, proudly points out that the seat of county government is in fact the only town actually named in honor of Honest Abe when he was a vertical man. And this is where the fresh fruit enters the picture in the shape of a voluptuous watermelon. It was on the hot day of Aug. 27, 1853, that Lincoln stood near the corner of what is now North Chicago and Broadway streets, snatched up the melon and expertly cut it open with his ever-handy pocket knife. As an audience of prominent worthies looked on in the dust, Lincoln decanted the melon juice into a tin cup and then poured it onto the ground in what was described as a christening ceremony. Ladd says soaking a bit of the virgin dirt seemed about as good a choice as any, as it’s hard to symbolically anoint a namesake city that had yet to be built. “You can’t really do it like the wine bottle smashed against the bow of a ship,” he adds. Lincoln the man now belongs to the ages, and Lincoln the town is all grown up. But the watermelon remains. Sort of. Its memory is enshrined in the form of a 28-inch-long steel and painted replica melon slice which rests atop a concrete plinth next to a big “Looking for Lincoln” information sign giving bemused passers-by all the juicy details. No one is absolutely sure, but this may very well be the only commemorative watermelon to be found above America’s fruited plains, or anywhere else, for that matter. So why name the place for Lincoln? All right, he was a prominent Illinois politician and attorney but, at the time, the presidency, emancipation, saving the Union and ultimate martyrdom for the people he loved all lay locked in a future none present could have predicted. Ladd, who has a picture on his office wall of himself shaking hands with a smiling and, at the time, U.S. Sen. Barack Obama, says those destined for greatness give off a kind of vibe that makes your skin prickle. Retired history teacher Paul Gleason is one of the city’s leading historians and also points out Lincoln was the attorney for the Chicago and Alton Railroad, the arrival of which had prompted the creation of the city. He said town lots went up for sale as soon as that watermelon juice bit the dust, and they sold like hot cakes. By 1953, the city was celebrating its 100th birthday with a dramatic re-creation of the christening scene, and then along came President Gerald Ford in 1976 to do the honors all over again. “He was on the campaign train from Chicago to St. Louis, and one of the most memorable things for me was having him re-create the christening scene again and pouring the juice on the ground from the back of his railroad train,” recalls Gleason, 74. The steel melon had arrived on site earlier in 1964, paid for with determined fundraising from the local Kiwanis, Lions and Rotary clubs. The continuing price of the commemorative melon’s preservation is eternal maintenance, and that job falls to another retired teacher, John Sutton, who typically repaints it once a year. And the secret to painting a lifelike watermelon resounding in the mystic chords of memory? Collection of images of Abraham Lincoln throughout his life. For more information on Abraham Lincoln's activities in his first namesake town, access http://findinglincolnillinois.com/alincoln-lincolnil.html.